David Pott worked for ten years in drug rehabilitation centres and detached youth work and then moved into teaching for 19 years. He was head teacher of two independent schools. David is a keen naturalist and a long distance walker. In 1997, he completed a 680 mile solo pilgrimage called Peregrinatio 97 commemorating the 1400th anniversary of St Columba and St Augustine. He has led several pilgrimages and walks with a reconciliation theme, such as the Offa’s Dyke Torch March along the ancient boundary between England and Wales. Between 2000 and 2007 David led the Lifeline Expedition and the March of the Abolitionists – a series of reconciliation journeys in connection with the legacy of the Trans-Atlantic slave trade which has received widespread media attention. 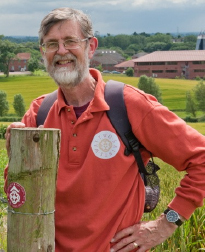 For the last five years David has been involved in setting up the Two Saints Way, a pilgrimage route between the cathedral cities of Chester and Lichfield. See www.twosaintsway.org.uk David has been married to Pam since 1970 and their three children are all married and they rejoice in nine grandchildren. David and Pam moved to the Isle of Arran in May 2013 and are involved in a project at Sannox.